Managing social media in higher education is a unique challenge. At first glance, you would speak to the students attending the school. But a higher education institution is more than that. It’s a community of students, educators, researchers and alumni. Let’s also not forget interacting with prospective students. 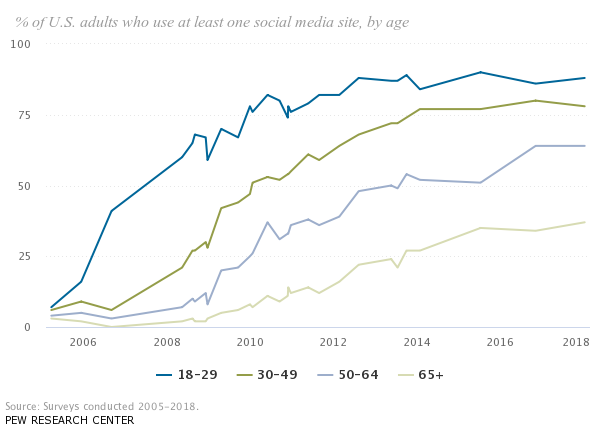 Pew Research Center found in 2018 that 88% of adults aged 18–29 uses social media. When you move up a generation to ages 50–64, they found that 64% still use at least one social media site. This likely encompasses a majority of your higher education audience. Taking advantage of social media as another communications channel is a surefire way of reaching a good chunk of your audience as a university. In this article, we’ll give you 10 textbook strategies for managing social media for higher education accounts. Think you’re ready to dive right in and get on the phone with one of our social media experts? Fill out the below form and we’ll give you a personalized demo on how a social media management tool can help. How will potential students and current faculty find out where you are on social media? Make your official channels very easy to find and then consider listing all the approved accounts in a directory for anyone to find and follow. The most important ones, like departments, colleges and services, should be included. NYU has a page dedicated to social media for NYU accounts. The directory is an easy reference guide for various departments and their associated channels. Furthermore, they’ve created sections for best practices and training. 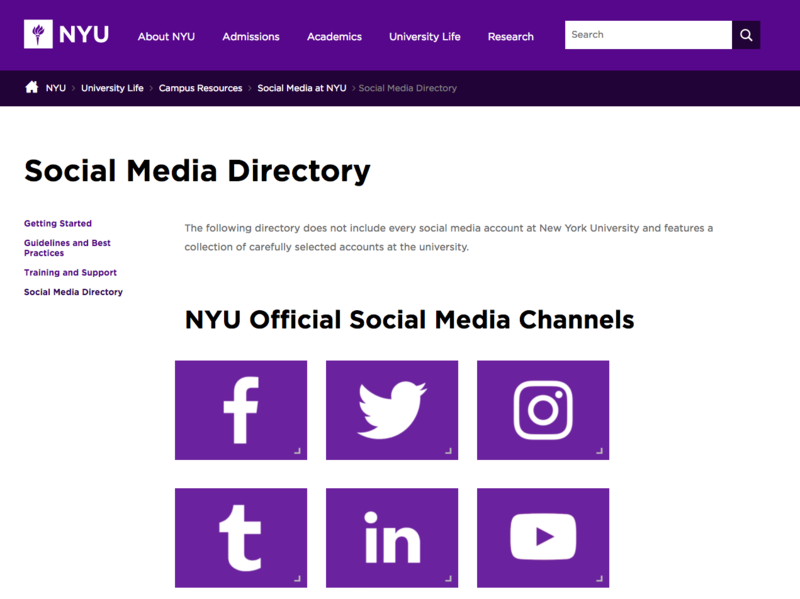 To keep its hundreds of accounts representative of the NYU brand, their guide includes the dos and don’ts of creating a profile page, examples of great profile photos and even provide ready-made images for easy setup. Check out our article on how to create a social media style guide to learn how you can do the same. Knowing where people are is only half the battle, though. You should do research on your own networks to see what type of content is resonating where. If college students mostly use Facebook to connect with their family and Snapchat to talk to friends, you’d likely choose Snapchat for your next student takeover. 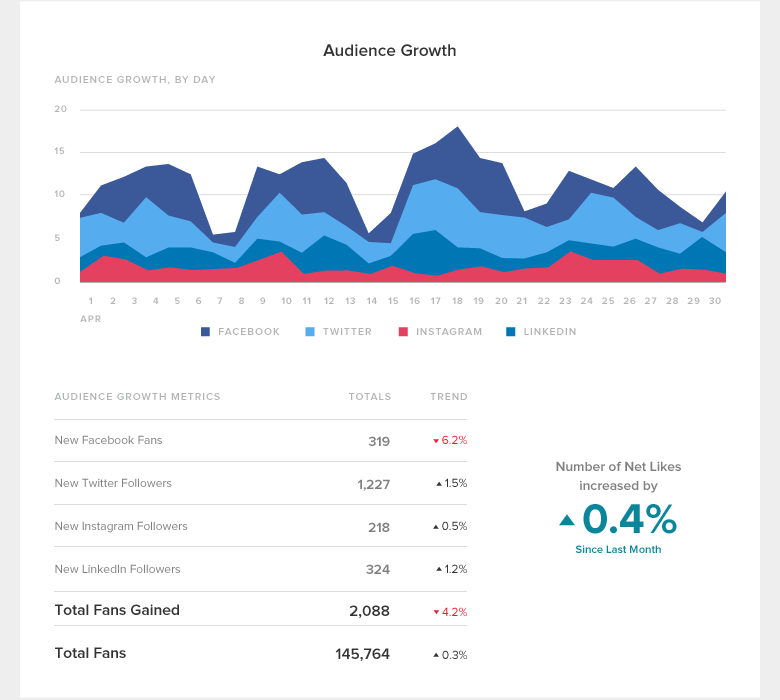 Learn how to analyze what works for your audience through our helpful blog post. For your audiences on Facebook, create Page-associated Groups. Since communication in Groups isn’t throttled by Facebook’s ever-changing algorithm, you can easily connect with those you want to reach. 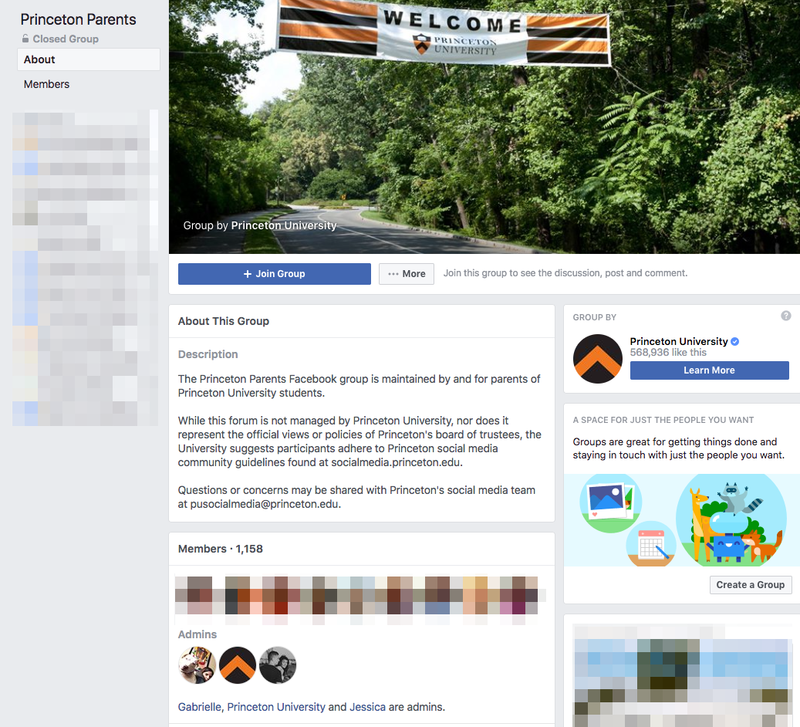 Princeton’s main Facebook Page features a closed parents group for students’ parents to connect to each other. The space gives other parents an opportunity to discuss relevant topics and provides a support network. Using Instagram Stories or Snapchat Stories for authentic sharing is an excellent way of connecting to a younger audience. The ability to respond via private messaging keeps communications more personalized. Harvard recently put together a news announcement through Instagram Stories. They kept each photo fun, engaging and informative. The Story also connected to the published announcement and to their most recent Instagram post. Your social media team can only do so much content creation. Why not hand over the virtual reins to student ambassadors for takeovers? Student ambassador programs function just like an influencer marketing program would. You find people who are keyed into certain areas, have them source or create content and offer a takeover every once in a while. Ambassadors are important because they keep a pulse on what’s happening around campus and can be more personal than an administration-run account. Flager College created a series called “Action News Flagler” hosted by students. The purpose was to showcase events and other interesting tidbits around campus. Creating student ambassadors, especially for Snapchat, gives you more time to engage and less time to worry about fresh content. How do you reach your current and prospective students? Take the previous idea a step further by creating accounts that are for students and by students. Instead of blatantly recruiting, use current students to tell their stories for you. DePaul University uses this account with a new student takeover every week. It works on a multitude of levels. It gives prospective students insight into what life at DePaul is like and it introduces current students to new places and people. Most schools have a crisis communication plan that includes a mix of SMS messaging, emails and automatic phone calls. When an emergency occurs on campus, it makes sense to also send the alert out via social media. For current event responses and other related crises, using social media to share positions and information is one of the easiest ways to get the word out. For many parents and alumni, social media is what they use to connect to the school. A scandal or major event will undoubtedly happen and the best way to handle it is to have a crisis plan in place. Colorado State’s Admissions department addressed concerns on admissions being affected if an accepted student was suspended due to protesting. It’s a response to a valid concern and shows that they monitor what their audience is talking about. The main accounts of a college will have an even mix of department news, student information, alumni engagement, recruitment and sports. It’ll likely also have the most followers of any of the other accounts. However, the benefit of creating separate accounts is that you can deliver the content your audience signed up for. If they follow the basketball team, they expect live gameplay tweets, not the most recent advancement from the physics department. Georgia Tech has hundreds of associated accounts. Each one is still branded but their content is more relevant to their followers. That’s why so many colleges and universities turn to social media management tools like Sprout Social. Easily managing multiple accounts, with a few or dozens of users, is tricky to do without a little help. Those in higher ed turn to Sprout because of our easy-to-use tools, vast analytics and listening features to join important conversations revolving around the university. Want to see us in action? Try Sprout Social for a free 30-day trial today! And here’s a look at how Marquette University uses Sprout to seamlessly manage over 70 different social media profiles. If you have the content and someone available to manage the accounts, your department could benefit from having a social media presence and a management tool. Going back to an earlier tip, sign up for the accounts where your audience is. For example, if you are a graduate studies department, you would likely prioritize Twitter over Snapchat. Whether you’re on the team that’s overseeing all of the university’s efforts or you’re running a single department’s accounts, you need to have an effective system in place. How do you learn about events that are happening around your college? How do you share that someone in your department won an important award or published an important finding? If it’s a small department, you may find using a form to be easiest. Have an open form where people submit social media post-worthy content. For those who are unfamiliar with what’s post-worthy, draw up examples and guidelines to follow. For a larger scale, it may be worth investing in a messaging platform like Slack, where you can source and dispense content easily. You can separate channels out for specific topics or decide that some are to be link-sharing only. 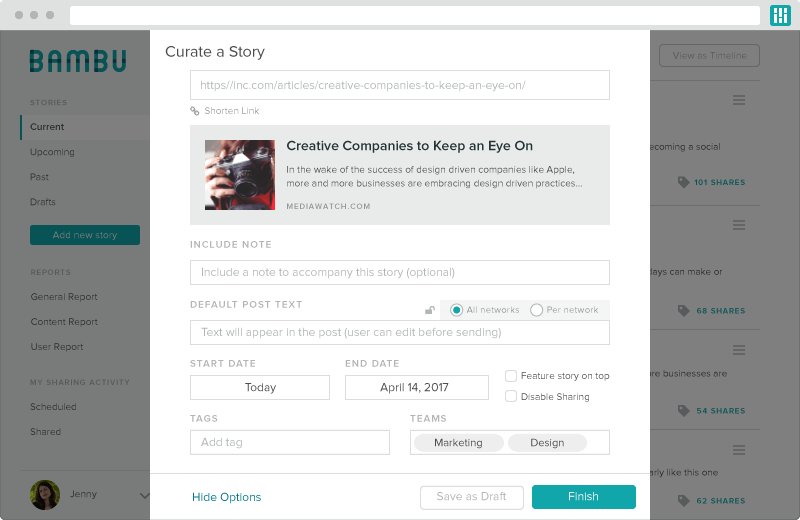 And if you’re really in need of more organized internal communications, consider a service like Bambu that is designed solely to curate content and improve employee advocacy. It can keep communications clear and also takes advantage of the enormous community your school already has. On the management end, most higher education schools have a social media team in place that oversees the school’s dominant networks. They may even share control of department accounts. 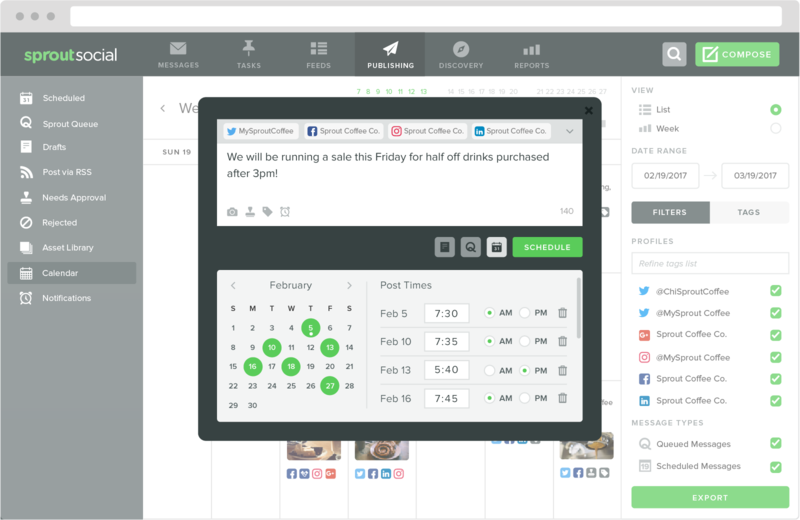 Having a tool like Sprout Social, where multiple users can connect and the same content can be posted to various accounts, can be very useful for cutting out communication time. If a piece of news is important and applicable enough to be shared by multiple departments, you could easily schedule the tweet across three different accounts in one click. Another benefit of connecting accounts together is that the social media team can pull a group analytics report to see how the school brand is faring overall. Sprout Social’s Group report can take a look at various connected accounts in one big overview. It can also help you track if some accounts are underperforming or growing exponentially. There are many ways to execute a successful strategy in the higher education space. With this piece, we provided some general tips and specific inspirations to test out with your accounts. What strategies have you found to be the most successful?